I started my journey drawing and writing comics in the 90′s, back before the internets and googles. I’ve pretty much done it all, from hand stapling my own mini comics, self publishing, freelancing for indy comic companies & writers, and I was one of the first crazy kids to put my comics up online for free in the late 90′s when everybody thought that was insanity; now webcomics are the most read comics in the world. I’m probably best known in comics for my series “Hero By Night”. 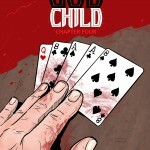 After a brief hiatus I’m glad to be back creating and drawing “The God Child” which you can read at this link.